Misano, 22 June 2014 – Finishing on the podium twice in Misano, Marco Melandri confirms the competitive edge that he reacquired with the double win at Sepang in Malaysia, while team mate Sylvain Guintoli managed to defend his second place in the championship standings. The 32 points earned in Emilia Romagna – thanks to two third place finishes – are the second major spoils for Marco Melandri in his first season astride the Aprilia RSV4 and allow him to continue his climb in the upper part of the world championship standings. 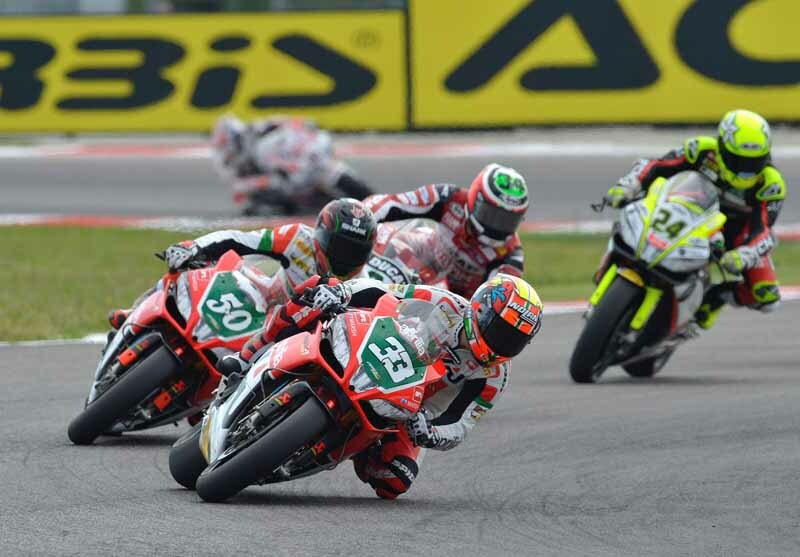 At Misano Marco gained 12 points on Rea and reduced the gap behind fourth place to 20 points. In Race 1 Melandri got stuck in the pack through the first turns, then having to fight to regain positions from eights place, a job he carried out skilfully, finishing in third place for his first podium of the day. Race 2 was an exciting duel behind Sykes, battled out between Melandri and Baz to the excitement of the Italian crowd with Marco finishing the race in third place. Marco Melandri: “I’m pleased with the way I rode today. I had a good feeling with the bike. In Race 1 after a few mistakes at the start I was able to overtake the riders in front of me, but the Kawasakis were quite simply faster. I’m disappointed about Race 2 because I was able to make up some ground thanks to the work done in the garage. Unfortunately it is very difficult to overtake here and Baz rode very well and didn’t make any mistakes. I think I could have given Sykes a run for it. I wouldn’t have made it easy for him. It’s a shame that we weren’t able to fully verify the progress we made. After Sepang I was consistently fast here too. We are on the right track in terms of feeling so we just need to keep improving from here. Portimao, with its layout, will be able to give us a hand”. Sylvain Guintoli was one of the protagonists of the day, battling in the top spots but stopping at the foot of the podium twice, finishing fifth and fourth, placements that allowed him to fend off the attack by countryman Baz and hold onto second place in the championship standings. Sylvain Guintoli: “In terms of the championship at least I am holding onto second place in the standings. But I definitely was expecting more. We are not missing any pure speed, but we need to work on consistent performance as far as race pace goes. In Race 1 we made the wrong tyre choice, whereas in Race 2 with the right options and a few changes to the bike geometry we were able to significantly reduce the gap behind the leaders. While I was with Marco and Baz I made a few mistakes too many which kept me from battling for the podium in the end. It’s a shame there is no Race 3… All joking aside, we need to keep working to be more consistent in the race”.